Viewers of TG4’s Beidh Aonach Amárach got to witness the excitement, tension and fun as they caught up with the competitors going for glory at Ireland’s country shows and fairs. This week Beidh Aonach Amárach visited Clogher Valley Agricultural Show in County Tyrone. Featuring were Proinsias Ó Donnghaile from Augher who was showing his vintage tractor; Sean McGovern and his four daughters (pictured) from Clogher who are going for top spot in the cattle classes at their home show and across in the horse rings Dianne Crean, from Tralee, and Balinasloe’s Tom Mac Lochlainn are judging. Meanwhile, show secretary Ruth Montgomery was making sure everything runs smoothly and welcomes special guest Dame Mary Peters. The series is produced and directed by Bernadette Morris, who spent several months throughout 2018 with cameras and crews to capture the stories of the people of all ages and backgrounds who vie for the top spots in a startling array of classes. 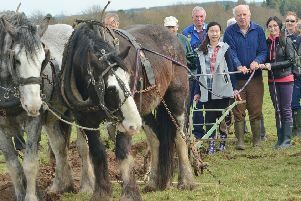 Viewers see competitors giving everything to be Best in Show - from cakes to cattle, flower-arranging to sheep-shearing, showjumping to shiny cars, never mind the best vegetables, dogs, birds, clothes, art and craft. They also join the army of volunteers who organise and judge these events. The pressure is on when several thousand people are going to descend on your village for the “show”. Beidh Aonach Amárach was shown on TG4 on Thursday, January 17, however it is repeated on Monday, January 21, at 5.30pm.